Is He Throwing A Tantrum? Hunchy Dont Wanna Take A Bath, No! Well Hunchy IS a queer one. Never has two-fisted action been so frightening to contemplate. Those final words just remind me of Rocky Horror Picture Show. It adds new dimensions of double entendre. 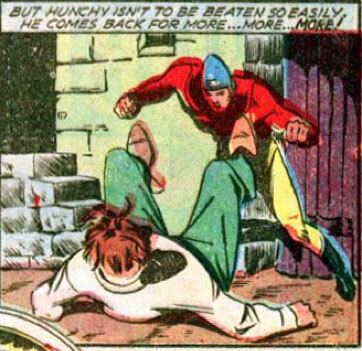 So if bulletman and hunchy do it, is that the beast with three backs? Hunchy? The actor? Caught in a scuffle with national superhero Bulletman. Another celebrity icon has fallen from grace. I remember him when he played the fat kid in ‘Friends Till the End..of Summer’. And who can forget his pivitol roll in the indie hit, ‘Keeper of the Sack’? And for those of you that don’t know he played the part of Passerby Number 17 in ‘The Hunchback of Notre Dame’. * Stay tuned to TMZ to find out more. *editor’s note: I know what you’re thinking…how can old Hunchy Winthrop not land the lead role in ‘Notre Dame? The producers just didn’t feel he was authentic enough.